As Northern Ireland struggles to offer a coherent and unified contribution to the Brexit negotiations in the absence of an Executive, Dave Whelan talks to MEP Jim Nicholson about his role in bringing Northern Ireland’s precarious position to the attention of both Brussels and Westminster. By his own admission, the official triggering of Article 50 by Theresa May essentially handed long-serving MEP Jim Nicholson a pre-dated P45 for 2019, the date of the next European Parliament election. Despite advocating for the UK to remain in Europe prior to the referendum, Nicholson is hopeful that the triggering will now provide some much-needed clarity on the details of the exit process and plans to draw on almost 30 years’ experience in Brussels to ensure the best outcome for Northern Ireland. However, while he accepts Northern Ireland faces an “uphill task”, the member of the EU Agriculture Committee has ruled out any form of special status to protect Northern Ireland’s economic interests as a region, instead putting his trust in the UK, as a whole, negotiating favourable terms. “I think talk of a special status is a total waste of time and I believe the vast majority of people in Brussels see that. Europe doesn’t do regions, Europe does nation states,” says Nicholson. “These negotiations are going to be carried out by London and my focus has been getting it through to London’s ministers coming over to Brussels the importance of recognising Northern Ireland as the only part of the UK that is going to have a land frontier. However, anyone who believes that Northern Ireland will be negotiating is living in cloud cuckoo land. It’s going to be done by the UK Government on behalf of all the people of the UK. Nicholson believes that, aside from some provisional organising, negotiations of any substance between the UK and Europe will not take place until at least September, following the outcome of the German national election. However, he states that the shape of these early negotiations will be crucial to the shape of the final outcome. Despite some optimism that negotiations will be smoother than first expected, largely based on the tone of Theresa May’s letter to the EU Parliament, which Nicholson confirms was better received than her speech in January, opposing stances have already started to emerge. Theresa May’s hopes that Britain’s exit and future trade deals with the EU could be negotiated in tandem have been rebuffed by Europe, which is seeking separate negotiation periods. As well as liaising with the UK negotiating ministers and the EU, Nicholson says that the European Conservatives and Reformists (ECR) have also been proactive in their approach. One avenue he states there has been provisional work on is exploring the possibility of a new customs union between the UK and Europe. Asked whether he thought the pending scenario made Irish unity a more likely outcome, he responds: “Although I was in favour of remaining in the EU, do not think for one moment that I or any other unionist would now, as a stop gap measure, consider a united Ireland because of this scenario. 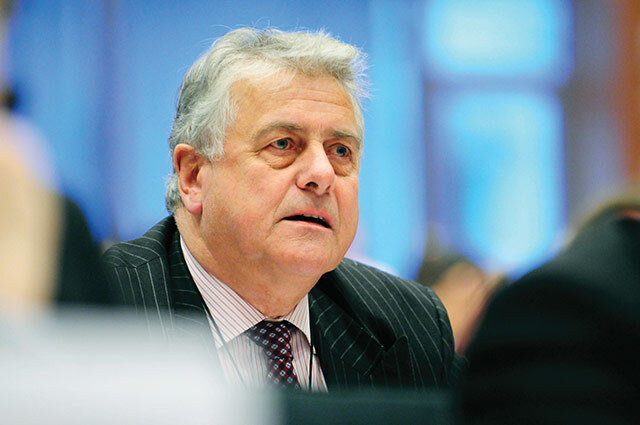 Turning his attentions closer to home Nicholson states that he will not be left wanting for something to do once he is no longer required to serve as an MEP, but has not given what form that will take. Despite a poor Assembly seat return for the UUP in the latest election, a result which saw a gain in the number of first preference votes not reflected in their share of seats, he is optimistic about the future of the party moving forward. He personally didn’t share the view of former party Leader Mike Nesbitt around transferring votes from the unionist party to the nationalist SDLP, a statement that has now been largely attributed to Nesbitt’s downfall, but does see a crucial role for opposition to exist in any future government. Although very well-respected within the party, Nicholson declares himself “not of the right vintage” to contemplate party leadership but is instead looking forward to working with incoming leader Robin Swann.